PEPPARD kayaker Sam Kirschstein has been hand-picked as a future British Olympian after being chosen to be part of the Lloyds TSB Local Heroes initiative. 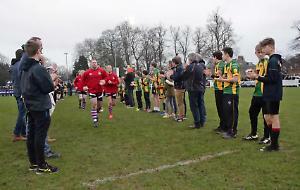 The 16-year-old will receive a cash injection of £1,000 towards training and competing and is one of only 128 youngsters selected from across England and Wales. Kirschstein attended the launch at Loughborough University where he rubbed shoulders with Olympic champion Katherine Copeland and Paralympic gold medallist Richard Whitehead. And Kirschstein, who attends Henley College, reckons his recent recognition will be just the confidence boost he needs ahead of a hectic year. Kirschstein said: “It means a lot to me to be named on the Lloyds TSB Local Heroes scheme for the first time. It shows that I have been recognised as somebody who has some potential but also it will give me a lot of help. “I can use the funding to help me travel to more competitions and also for equipment. It can be quite an expensive sport so it is a really big help for me. “I have already done quite well in my short time competing and have won some medals and it is always great to do well in competitions as that is why I do the sport. “It is a great sport to be a part of, really exciting and also different. I watched London 2012 and obviously Team GB did very well in canoe events, which was good to see. In partnership with SportsAid, the Lloyds TSB Local Heroes initiative is designed to ensure more talent reaches the top of their sport. SportsAid has been supporting talented athletes for more than 35 years and Copeland, who claimed lightweight double sculls gold at the London 2012 Olympics, believes Kirschstein and co are the future. Copeland said: “I used to be a Lloyds TSB Local Hero quite a few years ago now and it really helped me. The level I am at now, I get financial support. Lloyds TSB Local Heroes, in partnership with SportsAid, has supported 1,000 of Britain’s most talented developing athletes. As part of Lloyds TSB’s commitment to helping future sports stars prosper, the programme will continue this year.